We have already had days over 90° Fahrenheit this year, and more in the high 80’s. This heat is not just uncomfortable – it’s dangerous! This is especially true for dogs and cats who have long fur and rely on panting to cool themselves. 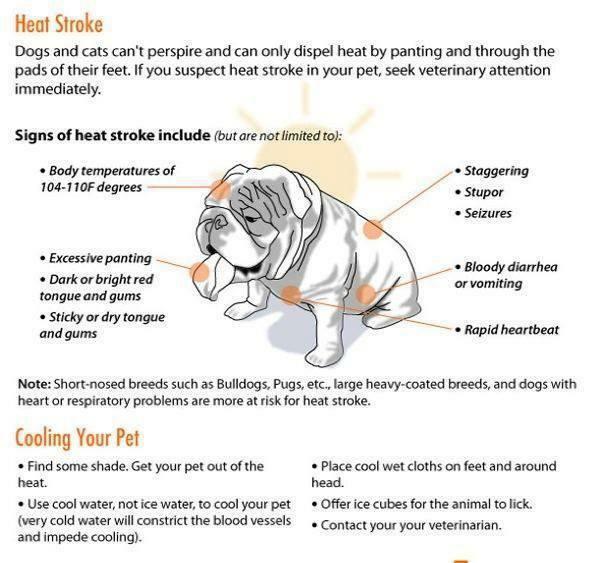 It’s important for Pet-Parents to brush up on our knowledge of heat stroke and heat related problems. We can prepare so that our pets are safe this summer. Heat stroke is a very real threat to dogs and cats in the summer. The combination of high temperature, high humidity and poor ventilation is potentially deadly for dogs and cats. 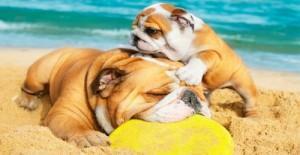 The pets most prone to heat stroke are flat-faced breeds, such as Pugs, Boston Terriers and Shih Tzus. Senior pets, puppies and kittens, and overweight pets are also particularly vulnerable to the health problems associated with intense heat. If your pet falls into any of these categories, pay extra attention to making sure your pet is safe and cool. The most important and simple way to prevent heat stroke is to avoid circumstances that cause overheating. Never leave your pet in a closed vehicle for even a few minutes. Cars heat up very quickly, and cracking the windows a little will not prevent the temperature from rising rapidly. Beware of stepping on hot asphalt with bare paws. Some Pet-Parents prefer to put shoes on their pet’s paws during extremely hot or cold weather. Always have cool, fresh water available for your pet to drink. Dehydration can set in quickly if you are not vigilant. To keep your pet trim and healthy, exercise your pet early in the morning or late evening. This way, you are able to avoid midday heat. If your pet shows any of the symptoms of heat stroke, cool the animal as quickly as possible. Get your pet into shade and apply cool, wet towels on the abdomen. Do NOT use extremely cold water or ice because these methods cause the blood vessels to constrict, which actually slows the cooling process. Contact a veterinarian, as treatment for shock may be necessary. winslowadmin | Pet Health, Tips, What's New at Winslow Animal Hospital!